With its stunning geography, geologic diversity, and low desert climate, Death Valley National Park is like no other place on earth. The borders of Death Valley National Park encompass 3.4 million acres of harsh, unforgiving desert terrain that will leave you awestruck. Uplift, extensive volcanic activity, erosion and deposition, and prolonged periods of inland flooding have helped to shape Death Valley into a world of its own. More than 20,000 years ago this once temperate climate was the home of the enormous Lake Manly, an 80-mile long, 600-foot deep inland lake that left behind some of the park's most unusual features. The lake also created the aquifer below Badwater Basin that feeds Salt Creek and occasionally surfaces as tainted water along the flats. Mineral deposits attracted mining operations to the area from the late 1800s through the mid-1900s, and several of these historic mines and extraction sites such as Harmony Borax Works can be visited throughout the park. It's a good idea to have a basic understanding of the geography before you make the drive to Death Valley. Many of the park’s activities are set miles apart, so plan on spending just as much time between destinations as you would on the trails. The park is loosely divided into five different areas. Furnace Creek, Stovepipe Wells, and Panamint Springs are along Highway 190 and offer campgrounds, lodging, and gas stations with basic provisions. Grapevine and Wildrose are less traveled and offer no amenities other than campgrounds, though they both have a lot to offer if you’re looking for solitude and some stellar views of the park. Devils Golf Course. Photo by John Cody. Furnace Creek is the hub of Death Valley National Park. Here you will find the Death Valley National Park Visitor Center in addition to a store, a gas station, and several other amenities. Four different campgrounds are nearby, and there are two resorts for lodging options. Some of the main attractions at Death Valley are not far from here, so you can get a good overview of what this park has to offer if you are here for a short period of time. Zabriskie Point: A popular viewpoint in Death Valley National Park overlooking the badlands of Badwater Basin. Badlands Loop Hike: This loop is ideal for those looking for a closer look at the landscape surrounding Zabriskie Point, and it is short enough to allow for plenty of other activities in the day. Desolation Canyon Hike: This short canyon hike is a great alternative for those looking for lighter crowds. Some scrambling is necessary, but the impressive views at the end of the hike are worth every step. 20 Mule Team Canyon: This scenic drive is a great way to experience the badlands around Zabriskie Point if you are unable to make a hike. Devils Golf Course: Unworldly landforms deposited by Lake Manly 10,000 years ago. Golden Canyon: The perfect spot to catch a sunrise reflecting over the Panamint Mountains. Gower Gulch: Part of an amazing hike through the canyons of the majestic Armagosa Mountains. Artists Drive: A beautiful 9-mile drive that really showcases the splendor of the Amargosa Mountains. Badwater Basin: A 200-square-mile salt pan that spans Badwater Basin. Natural Bridge: A 50-foot-tall bridge that has been naturally created by the erosion in the canyon walls. Harmony Borax Works: Former site for borax processing that is on the National Register of Historic Places. Ashford Mill: Built by the Ashford brothers to process the gold that came out of the Treasure Mine just 5 miles away in the Amargosa Mountains. Dante’s View: Terrific viewpoint at the top of the Black Mountains. Twenty Mule Team Canyon: A short loop drive through Death Valley’s characteristic badlands. Furnace Creek Campground: 136 sites that are available year round and are first-come, first-served from mid-April to mid-October. Some full hookup sites. Fiddlers Campground: Managed by the Furnace Creek Resort, this 35-site campground has plenty of amenities. Texas Springs Campground: Open October 15 to April 15, this 92-site campground is a quiet option. Sunset Campground: A good fit for RVs and trailers, this enormous campground is a great deal. The boardwalk at Salt Creek. Photo by Robyn Anderson. Stovepipe Wells is also a great choice for access to a lot of the park’s adventures. If you plan on exploring the outer regions of the park and still want to maintain the comforts of lodging and other amenities, this may be a good spot to stay for the duration of your time. Not only are there a bunch of adventures close by, the road to Scotty's Castle, Ubehebe Crater, and the Racetrack is not far away. Stovepipe Wells has a ranger station, gas, and a small store for minimal resupplies. Mesquite Dunes: Home to some of the largest dunes in the park, this area is also very accessible. 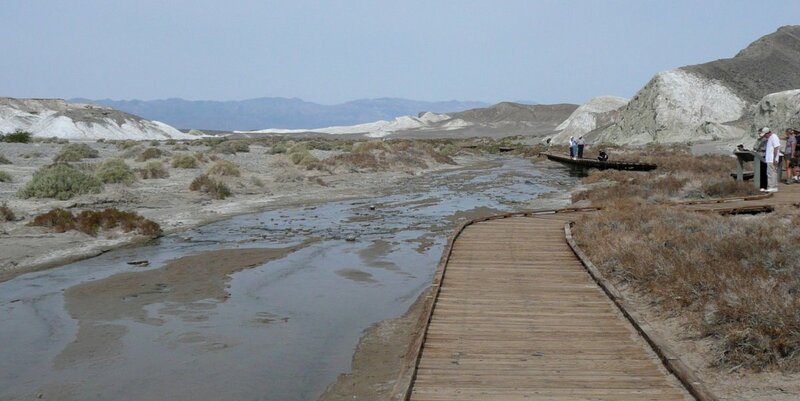 Salt Creek: A boardwalk allows visitors to stand right at the edge of this unique waterway. Mosaic Canyon: A popular 2-mile hike through a marbleized canyon. Stovepipe Wells Campground: This 190-site campground is open October 15 through April 15. Emigrant Campground: A 10-site, tent-only alternative that is 100% free. Chloride City: This early 20th-century mine site has plenty of fascinating equipment and structures along with the grave of James McKay. The drive out is very rough, however, and should only be attempted in high-clearence four-wheel drive vehicles. The mysterious sailing rocks at The Racetrack. Photo by Robyn Anderson. Following Scotty’s Castle Road from Stovepipe Wells will take you to the Grapevine area. If you're looking for solitude and a place to get away from the busy areas of the park, this is a great option for you. There are no amenities here, but the incredible views and Death Valley's natural diversity make this an amazing place to stay. From here, Ubehebe Crater and Scotty's Castle are just a short drive away. To reach the Racetrack, take the Racetrack Valley Road starting near the crater, but be aware that you will need a high clearance vehicle. Ubehebe Crater: Ubehebe is the largest of the unique Maar volcano craters that are dispersed throughout Death Valley National Park. Scotty’s Castle: Former residence of Walter Scott, also known as Death Valley Scotty, who was undoubtedly the area’s most colorful inhabitant. Scotty's Grave + Tie Canyon Trail: A short trail up to Walter Scott’s grave passes by some of the materials used to construct Scotty’s Castle. 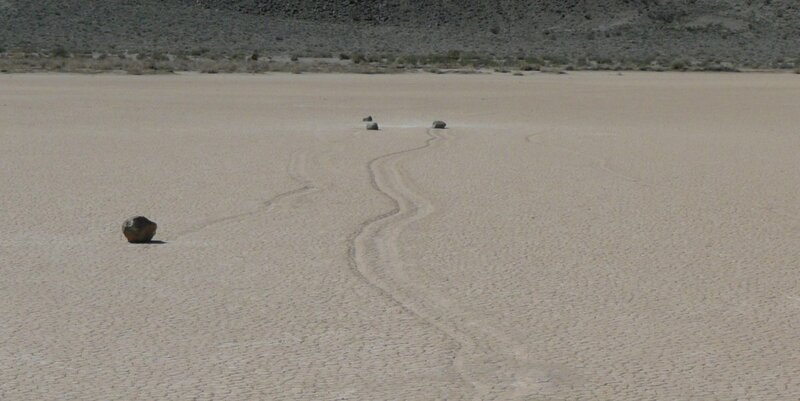 The Racetrack: A dry lakebed playa that is known for its unique geologic features and "moving rocks" phenomenon. Mesquite Spring Campground: A 30-site campground that is an ideal spot to set up for exploration of the northern portion of the park. Remains at the Eureka Mine. Photo by Race Jones. The Panamint Mountains dominate the landscape at Death Valley, and the 11,043-foot Telescope Peak is the tallest summit in the range. To access this peak, you will need to travel to the Wildrose area of the park. Though remote, this area is home to arguably some of the most beautiful landscape in the park. The Timbisha Shoshone people would come here during the summer months to escape the low-elevation heat and return to the basin in winter when temperatures were less extreme. Because of the elevation and temperature change in this area, visitors will find a unique population of flora and fauna. Telescope Peak: A 14-mile round-trip hike with 3,000 feet of elevation gain rewards you with spectacular views. Charcoal Kilns: Completed in 1877, these kilns are in superb shape because of light use. Wildrose Peak: An 8.5-mile round-trip hike with 2,200 feet of elevation gain, this is a great option if Telescope Peak is too snowy to attempt. Eureka Mine + Aguereberry Point: A fascinating collection of ruins from a mine abandoned in 1945. Wildrose Campground: This 23-site campground is open all year and is free. Thorndike Campground: A tiny, six-site, free camping option open March through November with minimal amenities. Mahogany Flat Campground: Ten free sites available on a first-come, first-served basis from March through November. Darwin Falls. Photo by John Cody. 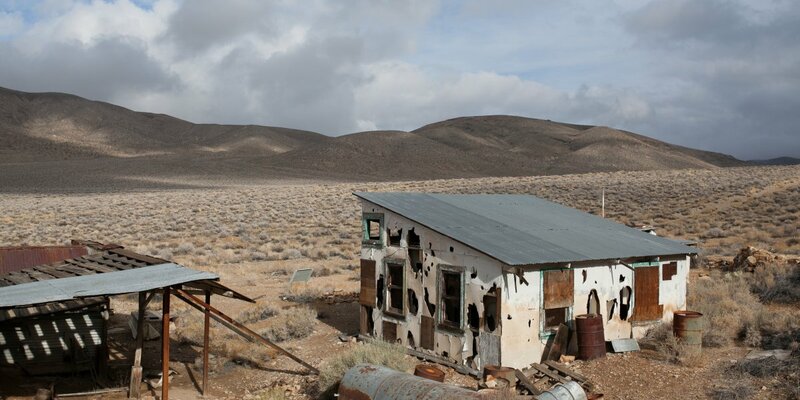 Panamint Springs is a small town located on the outer fringes of Death Valley National Park. This area does not have an abundance of activities, but it does offer a place to start your adventures farther into the park. It may also be a good option if you arrive at the park later in the day because it is near the entrance. Panamint Springs has a gas station, a store, options for lodging, and a few food choices as well. 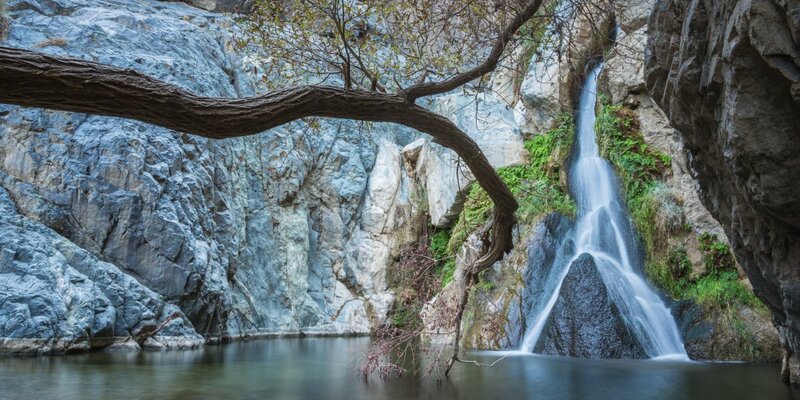 Darwin Falls: A cool and refreshing hike that is a perfect way to wrap up your visit. Father Crowley Point: Gorgeous views of Rainbow Canyon and the northern Panamint Valley. Panamint Springs Campground: Full hookups are available at this campground that also has tent cabins and plenty of amenities. With all of the exciting adventures that await, there are some real dangers you should consider before leaving the comfort of your campsite. While Death Valley National Park is a free-hike area that allows visitors to hike and camp almost anywhere, a free-hiking permit from the ranger station is required if you do decide to leave the common visiting areas. 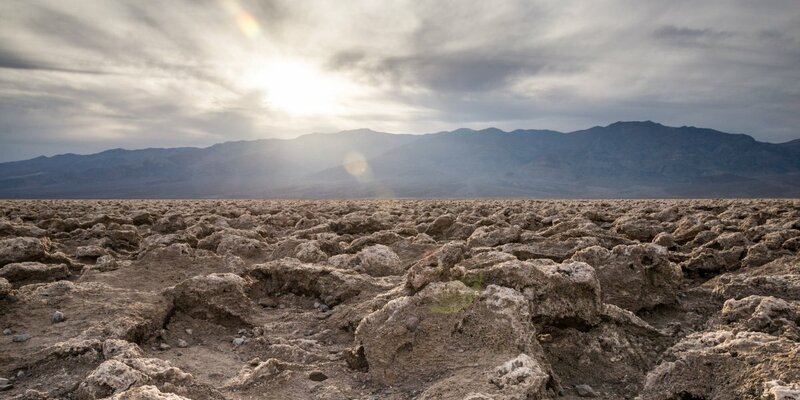 Make sure you are informed and well prepared for weather conditions before you go: Imagine traversing a bleak, inhospitable desert in 134-degree weather, the country-record air temperature recorded at Furnace Creek in July, 1913. Death Valley National Park has an average summer temperature of 116 degrees, and it averages 67 degrees in the winter. When traveling in Death Valley, be sure to bring plenty of water with you wherever you go. This landscape is so devoid of moisture, you can almost feel the earth stealing yours any chance it gets, even on the cooler days. Of course, bring plenty of sun protection for your body: hats, sunglasses, sunscreen, and protective clothing are essential. While Death Valley is known for its high temperatures, overnight temperatures can be quite chilly. Average overnight lows are near 40 degrees in the winter, so warm clothes are definitely in order in certain seasons. Beyond your normal camping gear, you’ll want to bring a portable shade for exposed campsites. Campfires are permitted seasonally and only in established campground fire rings, so a stove will be essential. Also, note that the only method of payment in some campgrounds is by credit card using an automated teller, so be sure to bring your credit card. Backcountry campers can obtain voluntary permits from the visitor center that help the park service locate you in case of emergency. Maximum stays for backcountry and most campgrounds are a whopping 30 days; Furnace Creek is limited to 14 days. For more on camping in Death Valley National Park, check here. There are a few lodging options in the national park in Panamint Springs, Stovepipe Wells, and The Oasis at Death Valley in Furnace Creek. Las Vegas is about a two hour drive from Death Valley National Park. Some of the adventures in Death Valley National Park are easily accessible and have parking lots right off the main road. A vast majority of them are not so easy to reach and require driving down dirt access roads that are minimally maintained. Some may require a four-wheel drive vehicle. These access roads will wreak havoc on small cars or sedans, so it is preferable to drive a high-clearance vehicle. If the roads do not slash your tires, they will shake your car apart, so use caution and take this into consideration when choosing a vehicle to use in the park. Also note that most car rentals do not insure vehicles that go off road. If you happen to break down, stay where you are and wait for help. Your vehicle can be a source of shade and supplies if you’re carrying extra water, food, and first aid. Consider bringing a full 5-gallon gas can into the park in case you run out of fuel in the middle of nowhere, and top off your tank when you can. Furnace Creek has the least expensive gas, followed by Stovepipe Wells. Panamint Springs is the most expensive, and gas there almost twice the Furnace Creek price. To protect wildlife and park habitat, pets are allowed only in developed areas of the park. This means campgrounds, roads, and picnic areas, and similar areas. They must be kept on a 6-foot leash whenever outside of a vehicle. Given hazards such as extreme heat and coyotes, visitors may want to consider leaving their pet at home. Geologic diversity. Historic landmarks. 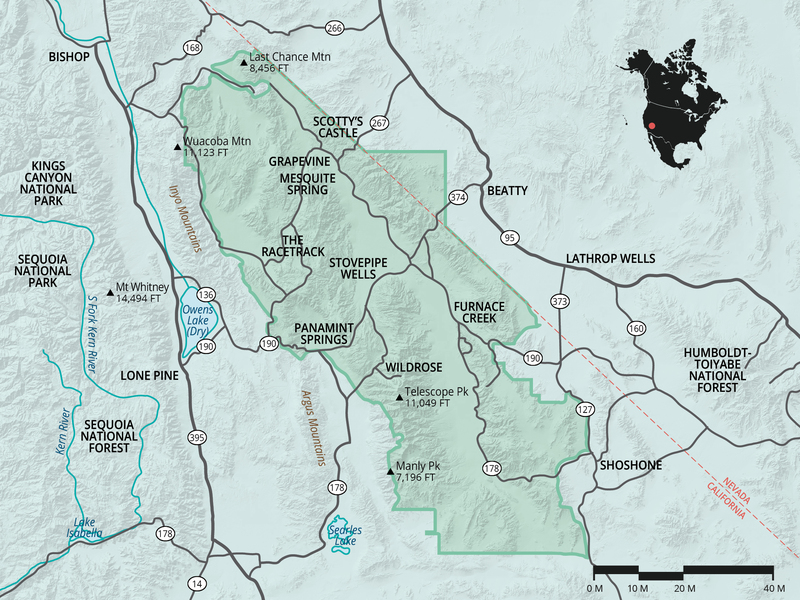 Free hiking and camping areas. Long commutes between adventures. Extreme heat. A great adventure for the whole family. This offers an amazing spot for sunset and sunrise photos along with star gazing since it's so far away from any cities.